Student demonstrators don't want to fall behind on their studies, so volunteers built them an outdoor study hall. Some of the desks are built into the concrete highway divider. 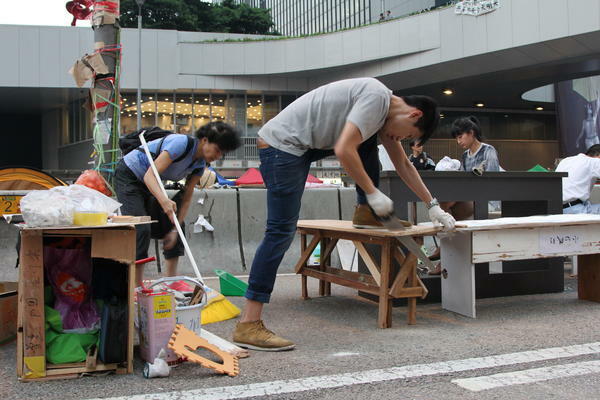 People with no past carpentry experience jump in to build tables and chairs from scrap wood so the students can continue their studies while protesting. The main protest camp of about 300 tents blocks Hong Kong's Harcourt Road, a major highway on the island. 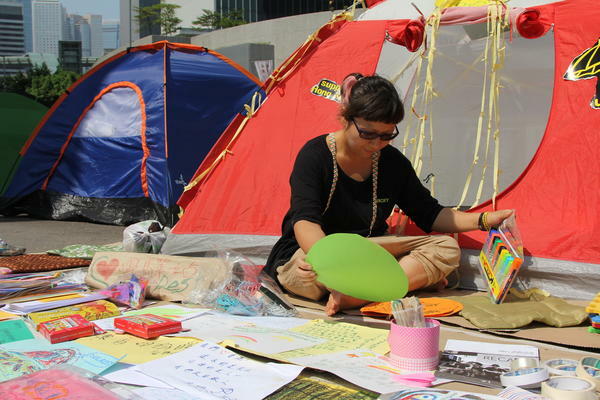 Map Tang, a social worker, has set up an art therapy center at her tent. She says protesters are exhausted after three weeks of demonstrations and need a way to express their feelings. 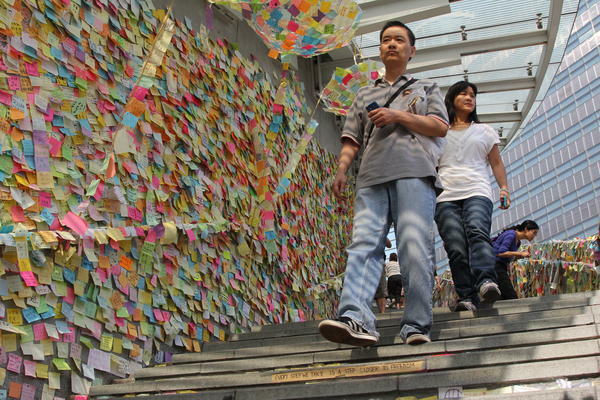 This is Hong Kong's "Lennon Wall," where protesters and supporters have put up thousands of post-it notes expressing their desires for democracy and support for the city. It's based on a similar wall in Prague. 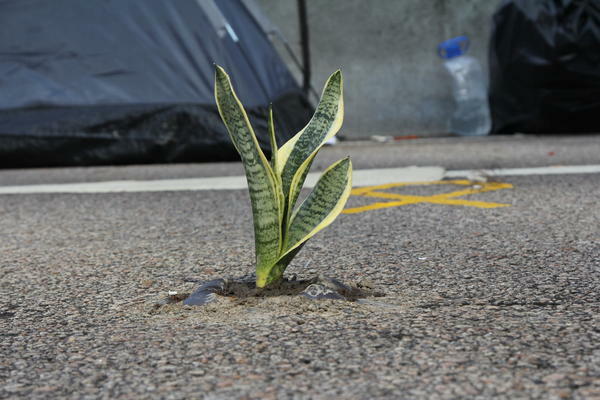 Like Hong Kong, the camp is intensely urban, but some protesters have tried to add a touch of green on Harcourt Road. 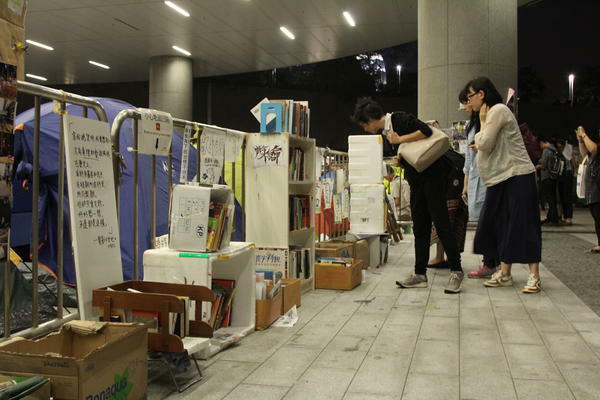 Protesters built a library in the parking lot of the Hong Kong leglislative council building. Volumes include Pride and Prejudice and The Economics of John Maynard Keynes. Hong Kong's main pro-democracy protest camp turned three-weeks-old over the weekend. What began as a road block has grown into urban village with several hundred tents that attracts more than a thousand people at night. The camp is a combo street fair, outdoor art gallery with political sculptures, propaganda posters as well as speeches, movie screenings and even a free library. The vibe here is like an American college campus in the 1960s, except it's on an island on the edge of the South China Sea and surrounded by skyscrapers. 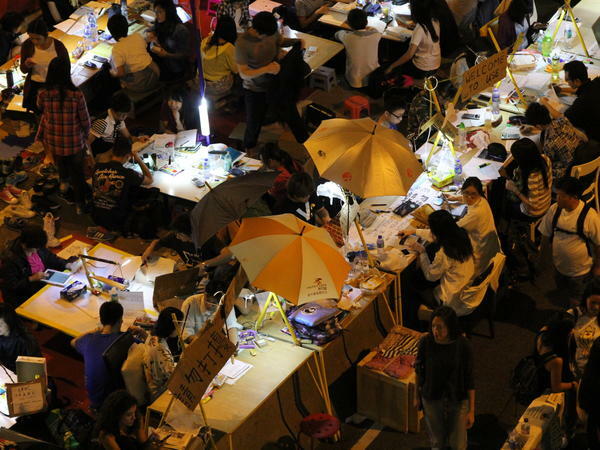 The pop-up protest community sprawls across and blocks Hong Kong's Harcourt Road, a major highway. Beyond the protesters' demands for democratic elections in 2017 for the city's chief executive, what distinguishes the place is a sense of community, which is best captured by the free services that have sprouted up to meet demonstrators' needs. The loudest is the open-air, furniture-making shop. Kacey Wong, a professor of design at Hong Kong Polytechnic University, says some of his students kicked it off. "This whole movement was generated from the students' boycott of the school a few weeks ago," says Wong. "They are thinking about boycotting school, but not boycotting studying. So how do you resolve this problem?" By sawing, hammering and drilling scrap wood into desks and chairs the students can use. The result: a study hall with electricity, lights and desks built into the concrete highway divider. Terence Tam, 26, works in information technology and is one of the furniture builders. "We are volunteers. They are studying very hard," he says of the student protesters. "We try to make them more comfortable." Tam, who wears a black shirt and jeans, doesn't know anything about carpentry, but says it only takes about a day to learn. "As a Hong Kong guy, I just think this is what I can do for this place and for the teenagers. I think they are not fighting (just) for their future, but also for our future." If scrap-wood carpentry isn't your thing, a few dozen tents away, there's art therapy. "There's a lot of things going on, a lot of emotions and feelings," says Map Tang, a social worker who set up an art space. Tang says three weeks of demonstrating have left many physically and psychologically exhausted. "That's why we have a tent here with all the materials of art making, so we can actually take care of ourselves and express our feelings," she says. On a tarp, Tang has set out construction paper, an array of colored pens, feathers, thread and stickers. One tool is conspicuously missing: scissors. "Because if you have something that is a weapon, the police can take you away," says Tang, who explains that people at the art space just cut paper by using their hands. If you need a place to crash for the night, check with Pat, who assigns some of the tents, which — like most things here — are donated by supporters and free. "Better be early because it's really, really full," says Pat, who works as a freelance graphic designer. Pat, who only gave her first name, says the tents are numbered and assigned first-come, first-served. The only problem is when winds whip through the urban canyon where the camp lies and sometimes lifts empty tents five stories in the air. Sooner or later, police will move to clear this camp, which is completely illegal. "I'll be really sad," says Elizabeth, who also doesn't want to give her full name. Elizabeth just graduated from college and has been spending a lot of time here. She says she's going to miss the camaraderie and shared sense of mission. "This whole building of community is essential if you want to have a sustainable movement, because we know this movement doesn't end just here, we have to continue it," she says. After the tents are gone, that's probably the biggest challenge. Many Hong Kongers support the protesters' democratic goals, but the camp has caused three weeks of traffic jams on this crowded island and most people in this city are looking forward to seeing it go. We turn to Hong Kong now. We're going to take a closer look at the protest community that has been at the heart of the democracy protests there. What began as a roadblock has grown into an urban village with several hundred tents that attract more than 1,000 people at night. The illegal camp is a combination of street fair and outdoor art gallery. There are sculptures and posters as well as art therapy, movie screenings, even a free library. 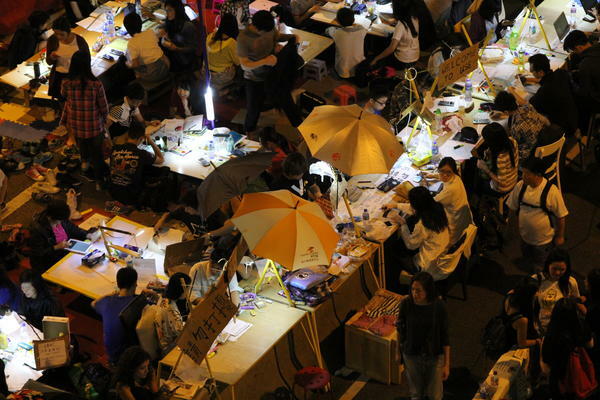 NPR's Frank Langfitt reports from the Hong Kong pop up protest community. BOB MARLEY: (Singing) Buffalo soldier, trodden through the land. FRANK LANGFITT, BYLINE: The vibe here is like an American college campus in the 1960s, except it's on an island on the edge of the South China Sea and surrounded by skyscrapers. 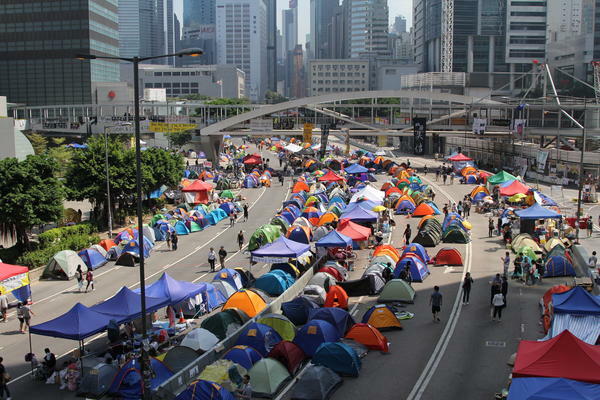 The camp sprawls across and blocks Hong Kong's Harcourt Road, major highway. Beyond the protesters' demands for democratic elections, what distinguishes the place is a sense of community best captured by the free services that have sprouted up to meet demonstrators' needs - like the furniture making shop. Kacey Wong is a professor of design at Hong Kong Polytechnic University. He says some of his students kicked it off. KACEY WONG: This whole movement was generated from the students' boycotts of the school a few weeks ago. And they are thinking about boycotting school, but not boycotting studying. So how can you resolve this problem? LANGFITT: By building students desks and chairs and creating an open air study hall that can now easily accommodate a hundred people. Terance Tam is one of the furniture builders. He's 26 and works in IT. TERANCE TAM: We are volunteers. They are studying very hard so we can try to make them more comfortable. LANGFITT: Do you know anything about carpentry? LANGFITT: And so where did the wood come from? TAM: From the garbage collection. LANGFITT: Why did you decide to do this? TAM: As a Hong Kong guy, I just think this is what I can do for this place and for the teenager. I think they are not fighting not for their future, but also our future. LANGFITT: If scrap wood carpentry isn't your thing, a few dozen tents down, there's art therapy. MAP TANG: There's a lot of things going on, a lot of emotion and feelings. LANGFITT: Map Tang is a social worker. She says three weeks of demonstrating have left many physically and psychologically exhausted. TANG: That's why we wanted to have a tent here with all our materials of art making so we can actually take care of ourselves and also express our feelings. LANGFITT: Tang has set out construction paper, an array of colored pens, feathers, thread and stickers on a tarp. One tool is conspicuously missing - scissors. TANG: Because you have something that is a weapon - lethal weapon the police can take you away. LANGFITT: What do you do to cut the paper? TANG: Just using our hand, just tear it off. LANGFITT: Sooner or later, police will clear this camp, which is completely illegal. ELIZABETH: I'll be really sad. I've been thinking about this a lot. LANGFITT: Elizabeth - she doesn't want to give her full name - just graduated from college and has been spending a lot of time here. She says she's going to miss the camaraderie and shared sense of mission. ELIZABETH: This whole building of community is essential if we want to have a sustainable movement because we know that this movement doesn't end just here, and we have to continue it. LANGFITT: After the tents are gone, that's probably the biggest challenge. Many Hong Kongers support the protesters' democratic goals. But the camp has caused three weeks of traffic jams on this crowded island. And most Hong Kongers honestly are looking forward to seeing it go. Frank Langfitt, NPR News. Transcript provided by NPR, Copyright NPR.